Yes, you can travel with a chronic health condition! Everyone knows that travelling is good for us in many different ways. And chronic conditions like diabetes, heart disease, asthma, HIV, and serious allergies shouldn’t stop you from enjoying the benefits of travel. Sure, extra precautions are needed for long flights, unfamiliar weather conditions, high altitudes and unsanitary conditions. Just follow these basic tips. · Activities: Make a detailed list of the activities planned for your stay. That will make it easier to determine your needs. · Jet lag: Don’t underestimate how jet lag can impact you and your medication, and make sure to allow plenty of time for rest. · Documentation: Make a list of all emergency contact numbers in your home country and the region you will be visiting, as well as your insurance papers and health documentation. · Medical care: Always have a Plan B. For example, in remote areas, it may be hard for people being treated with K or VKA antivitamins to achieve a balance. Plan for the worst, and bring everything you may need. · Doctor: See your physician 4 to 6 weeks before your departure, and go over all the details of your trip. He or she might decide it’s wise to step up treatment a little before you leave. Take note of symptoms to watch for and ensure you know how to effectively respond in an emergency. · Vaccines: If you are susceptible to illness it definitely pays to get all the recommended vaccines. 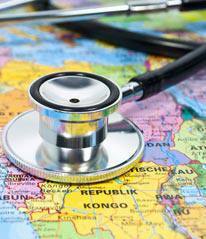 Consulting a travel medicine specialist is a good idea. · Medication: Always carry medication in its original packaging, with the pharmacist’s label. Make sure you have enough for the entire length of your stay, and a few extra days as well. Be wary of similar products abroad: counterfeit medications are an issue in many countries. When we travel outside of our normal environment, we can’t always predict how our body will react. Your medical kit should include preventive and curative remedies such as antihistamines and corticosteroids. Keep all of your medication in your carry-on just in case your checked luggage gets lost. And always carry multiple copies of prescriptions, ideally in English, to avoid complications at customs. · Climate: Extreme temperatures can cause blood pressure problems and skin irritation. It can also complicate storage of certain medicines like insulin. Bring remedies against sunstroke (for hot destinations) and chilblains (for cold ones). Read up on local pollens, insects, and animals that may be problematic. · Food: When travelling abroad you have to watch what you eat. Even foods offered with the best intentions can be risky. Be proactive to avoid diarrhea and dehydration. Vomiting can prevent the absorption of medication. · Precautions: Certain medication like steroids can weaken your immune system. Wash your hands often, consuming too much alcohol can cause dehydration and can exacerbate a variety of other conditions. To keep allergy risks to a minimum, keep allergy medication on hand, and don’t forget your sun screen! Even if you’re in perfect health, it still pays to be careful. If you have a chronic condition, a complete travel insurance plan is just the ticket to fully enjoy your trip and be ready for anything. Bon voyage!